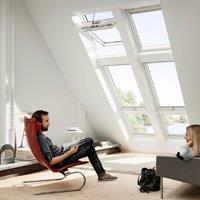 VELUX® have over 60 years’ leading the UK roof window market, filling millions of homes with daylight and fresh air. During this time they have developed a huge range of products to help you choose the perfect solution for your project. 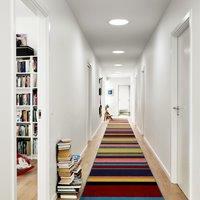 The six step guide below is designed to help you find that solution, and fill each project with natural daylight. 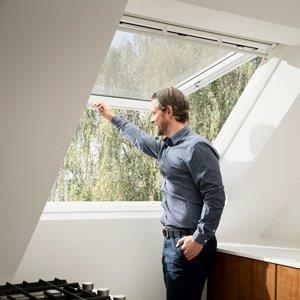 Before choosing roof windows and deciding on their layout, the function of the room and the personal needs of the occupants must be considered. What kind of room is it? Bedroom, bathroom, stairwell, living room, etc. Remember – the more daylight a room receives, the bigger it will feel. Consider increasing the size of the windows or combining them. 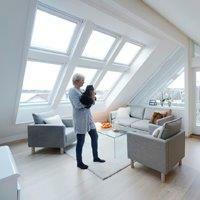 Consider the shape and volume of the room when choosing the number and position of the windows. 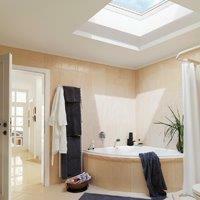 A deep room will benefit from windows positioned higher in the roof. A wider room will benefit from a series of windows installed at regular intervals. Ideal for out of reach situations. 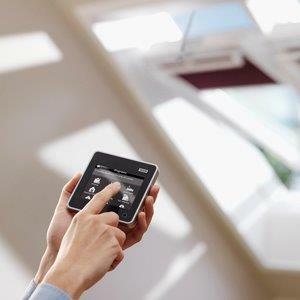 The new VELUX INTEGRA® control pad offers a range of programmes allowing you to control light, heat and ventilation. Opens outwards for an unobstructed view and feeling of extra space. Ideal for fire escape purposes. The top control bar makes it easy to open, even with furniture below the window. Ideal for a traditional interior. High quality natural pine. 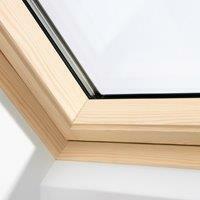 Protective triple coat clear lacquer which helps to preserve the timber of the window. Perfect for contemporary interiors and white ceilings. Ideal for humid rooms, such as kitchens or bathrooms. The polyurethane mould has no visible joins, ensuring a moisture resistant finish. Requires less maintenance than lacquered natural pine, ideal for out of reach areas. High quality moulded polyurethane with an insulated timber core. To further improve energy performance itʼs important to insulate around the edge of the roof window. 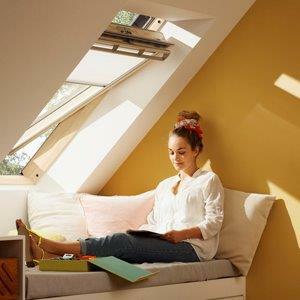 VELUX® have created a range of installation products to make it quicker and easier for you to meet building regulation requirements and provide a more comfortable indoor environment. A flashing ensures a weather tight installation and comes in either recessed or standard options. 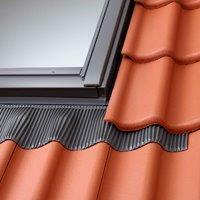 Recessed flashings will provide a more energy efficient installation whilst giving a streamlined finish on the outside. 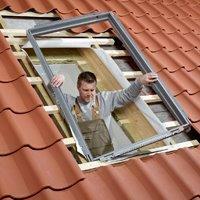 An insulation collar further reduces heat loss and eliminates cold bridges around the roof window. This makes it quick and easy for you to be compliant with building regulations. 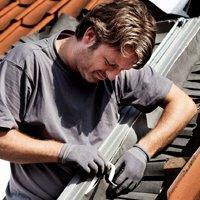 An underfelt collar ensures a weather tight seal and provides additional waterproofing. Again, this helps you to meet building regulations. 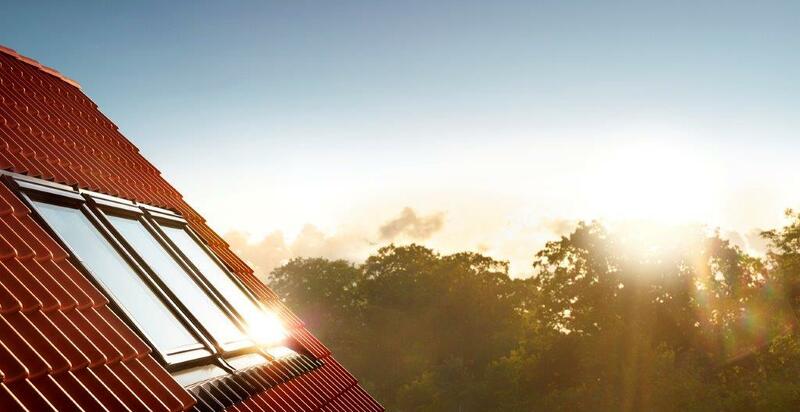 The vapour barrier helps prevent the build-up of condensation in the roof construction. Ideal for making your installation air tight. VELUX blinds, roller shutters and awnings not only look good, but also play an important role in managing heat and light, shading a room when it gets too sunny, and preventing heat loss..